View cart “Peavey XR1212 12Ch 1200W Powered Mixer” has been added to your cart. Since its introduction in 1998, the Powerpod740 (previously called Powerpod7) has proved to be an excellent choice for musicians and venues alike. The Powerpod740 offers power and flexibility that can withstand ‘life on the road’. Two separate 200 watt amplifiers enable the user to configure the output in three different ways, either Main + Main, Main + Monitor or Main only (Bridged operation, 400W). 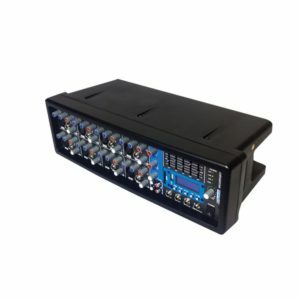 The Powerpod740 has all the patching necessary to connect you to more amplifiers and an external processor or to accept more inputs via another mixer when circumstances require. Categories: Powered Mixer, Pro Audio. Experienced musicians, performers, speakers, and club operators know the importance of a high-quality sound system with the right features and performance to deliver their sound. Where portability and convenience are important criteria, a system based on a high-performance Yamaha EMX-series powered mixer is definitely the way to go. In one integrated, portable unit you have a mixer to combine and balance your microphone and instrument and line sources, effects to refine and polish your sound, and power to drive the main speakers and even monitor speakers as well. But that’s nowhere near the whole story – Yamaha EMX-series Powered Mixers offer a range of features that let you mix, process, and deliver your sound with maximum quality and creative control … and, of course, that unrivalled Yamaha sound. Experienced musicians, performers, speakers, and club operators know the importance of a high-quality sound system with the right features and performance to deliver their sound. Where portability and convenience are important criteria, a system based on. The power mode switch lets you use the dual power channels as a stereo amplifier, or use one channel for the main speakers and one for the monitors, with separate monitor mix setup via the channel MONITOR controls. 16 Yamaha SPX effects—including reverb, echo, chorus, flanger, phaser, and even distortion—let you add the finishing touches to your live presentation. Graphic equalizers are provided for both the main and monitor power channels so you can effectively control feedback or tailor the sound to match the room and program material. 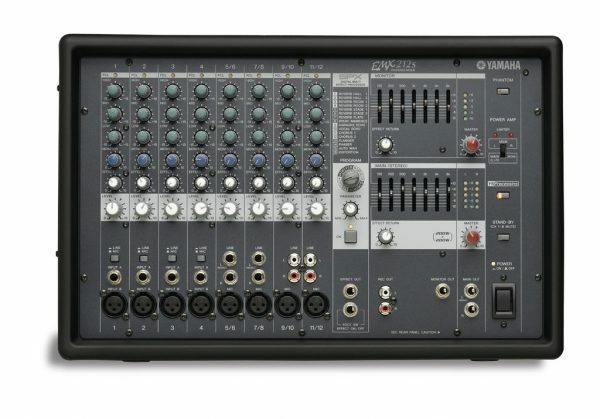 The Yamaha EMX212SC offers a total of 12 input channels—4 for monaural microphone (with phantom power) or line input, plus 4 pairs that can function either as monaural mic inputs or stereo line inputs—providing a versatile mix of input capabilities for a wide range of applications. If only mic inputs are needed, you can use up to 8 mic channels. 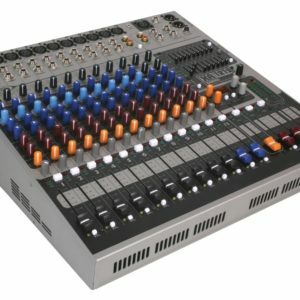 If you want to play recorded background music during breaks using a stereo input, and have a keyboard player with stereo outputs, you still have 6 mic/line inputs available. If all 4 stereo pairs are used to handle stereo line sources, you still have 4 channels available for mono mic or line input. It’s a versatile system that can adapt to your needs with ease! Yamaha Speaker Processing (YSP) provides optimized matching with speakers, for clean, solid reproduction that will deliver your music with maximum impact. 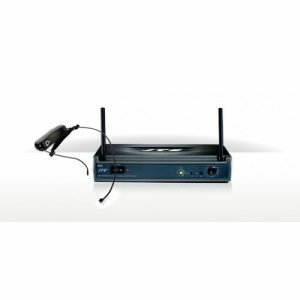 The Yamaha FCL (Feedback Channel Locating) system makes locating and eliminating feedback easier than ever. FCL indicators provided on each input channel indicate which channel feedback is occurring in, so you can identify it visually and adjust levels or EQ as required. Another handy features is a Standby switch that mutes channels 1 through 8 so that, for example, after rehearsal or between sets you can mute performer’s inputs 1 through 8 without having to change fader settings, while stereo inputs 9 through 12 remain active for background music playback. At only 22 pounds and featuring conveniently located handles, the EMX212S powered mixer is easy to transport. It’s built to withstand the rigors of the road and deliver reliable performance, night after night.